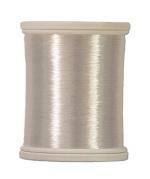 Superior Threads MonoPoly is a reduced sheen-stretch polyester Monofilament invisible thread in Clear or Smoke. Size=Very Very Fine. Monofilament thread, often called clear or invisible thread, is used to show off the quilting but not the thread.Superior MonoPoly is polyester and therefore is dryer safe, won't yellow, won't go brittle over time, and can be ironed at a lower heat setting. Superior suggests using a polyester invisilbe monofilament thread rather than nylon monofilament which has a lower melting point. Available in Clear and Smoke.